Preheat oven to 180°C/355°F. Halve, deseed, and slice hokkaido pumpkin into wedges. Peel and finely slice red onions and garlic. Chop sun-dried tomaotes and slice cod fillet. Grease a baking dish with olive oil and add pumpkin, onion, garlic, and sun-dried tomatoes. Season with salt and pepper, and add olive oil, orange juice, and fish stock. Bake in the oven at 180°C/355°F for approx. 25 min. Remove baking dish from the oven. Break taleggio cheese into smaller pieces and distribute over the gratin. 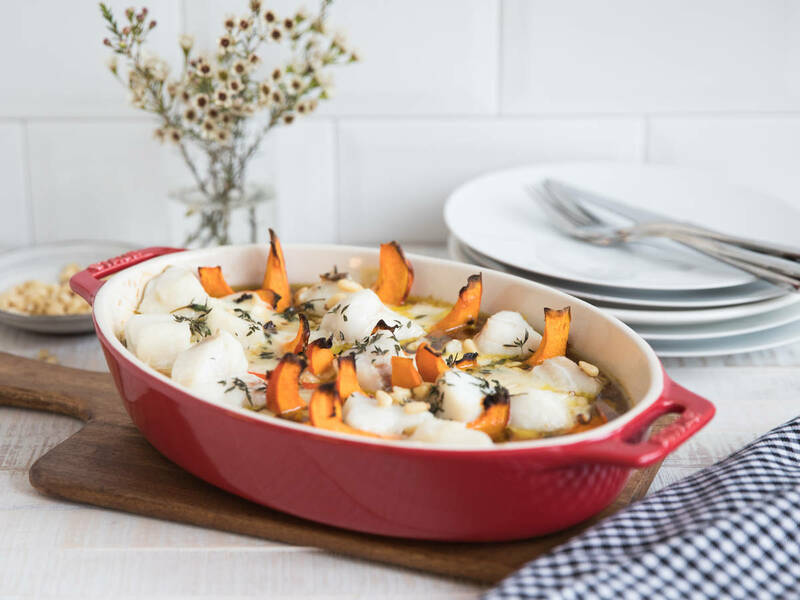 Add cod fillet and sprinkle with thyme leaves and pine nuts, then return the baking dish to the oven and bake at 180°C/355°F for approx. 10 min. more. Remove from the oven and enjoy!